Growing up, my little sister Rachael was always the skinny one: cute as a button; thin as a rake. But in her early twenties, each year brought extra kilos that have proven hard to shake. Rachael gains weight easily and struggles to lose it. Annoyingly for her, I appear to be one of those people who can – and do – eat anything they want. How can two people so closely related have such different bodies? Our dad was always pretty fit. While he sported an 80s beer belly, he was a fierce tennis player, spending hours on court in the scorching summer heat. Mum was also very handy with a racket. Sharing tall, athletic parents gave us the same genetic head start. But Rachael was the one who inherited their sporting skills; I was never much of a contender. Rachael also eats much healthier food than I do – it’s all fresh, organic and fairly carb-free in her kitchen. I, on the other hand, was nicknamed ‘chips and dip’. Looking at our diets, you’d expect our body shapes to be the other way around. As Rachael’s weight slowly crept up, her confidence crashed down. As we entered our thirties, I started worrying. I’d read that carrying weight around your belly can cause health issues – even if you’re a normal weight. Rachael is a sensitive soul, and I have been scared of mentioning her weight for fear of upsetting her. Having avoided the topic for years, can I bring it up now? I discovered myDNA through a friend of a friend. She told me about the Melbourne start-up that can quickly and cheaply reveal how your genes influence your health and fitness. I thought this could be a great way to help Rachael feel empowered to make some lifestyle changes (and start that difficult conversation). DNA analysis would tell her the foods and exercises that would best suit her unique and wonderful self, and she’d never have to be disappointed with diets that weren’t right for her again. As we sat down on mum’s couch to take the test, Rachael suddenly announced: “I don’t want the fat gene!” Only then did it occur to me that I could have the ‘fat’ variant of the FTO gene, and hers could be normal. How would she feel then? Nevertheless, we decided it was better to know. We were too curious: what do we share? Are our differences as we suspect? 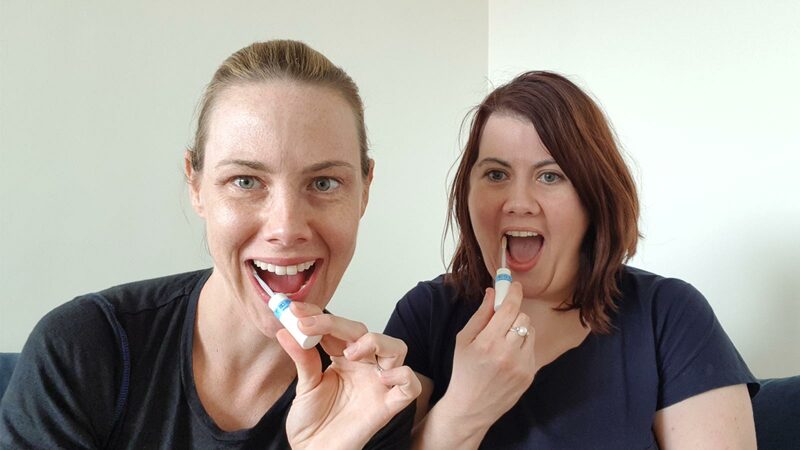 We opened the bright green myDNA kit, swabbed our cheeks, and sent off the sample in the post. We’ll have to wait another week for our results, but the experience has already brought us closer and we’re now having honest conversations about health and fitness. It’s a great place to start. Read about our results in next month’s newsletter. Previous post: How elite athletes are using DNA testing to gain an edge.